What are your wishes for the New Year? Do you have prayers for yourself, your family, and friends? Do you have aspirations for humanity? Hopes for the Earth? Can you express them in 18 Words? As we look to the new year of 5777, the Avodah Committee (Temple Sinai’s Ritual Committee) invites you to share your wishes for the New Year… in 18 Words or less. 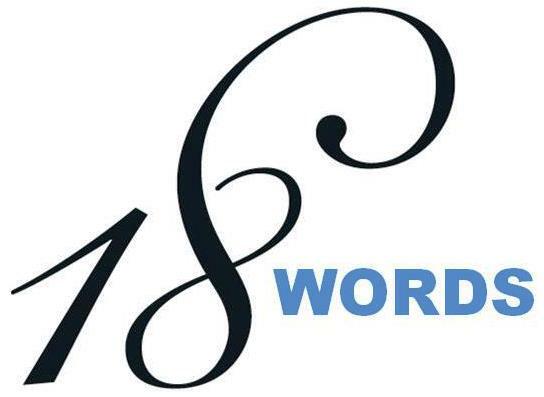 As a local version of the #18WORDS initiative of the American Jewish World Service, 18 Words at Temple Sinai gives us the o…pportunity to come together as a community as we share our prayers and aspirations for the New Year. Why 18 Words? Chai-life-has the value 18 in Jewish numerology, so the number has become the traditional Jewish symbol of good fortune, celebration, and life. Good fortune, celebration, and life-that’s only 5 words. Now it’s your turn to share your hopes for 5777. And you can use all 18 words. The approaching High Holy Days are a time of reflection and prayer. Composing your 18 Words can become a meaningful preparation for Rosh Hashanah and Yom Kippur. Write them individually. Create them as a family activity. Make them up with those you love. Just 18 Words. We’ll share these 18 Word of hope and prayer for the New Year in the Temple’s bi-weekly email announcements through Yom Kippur and plan to make posters of our 18 Words to display in the Bernhard Theater lobby for Rosh Hashanah and Yom Kippur services. Send your 18 Words to office@saratogasinai.org. You may submit your 18 Words by name or anonymously.